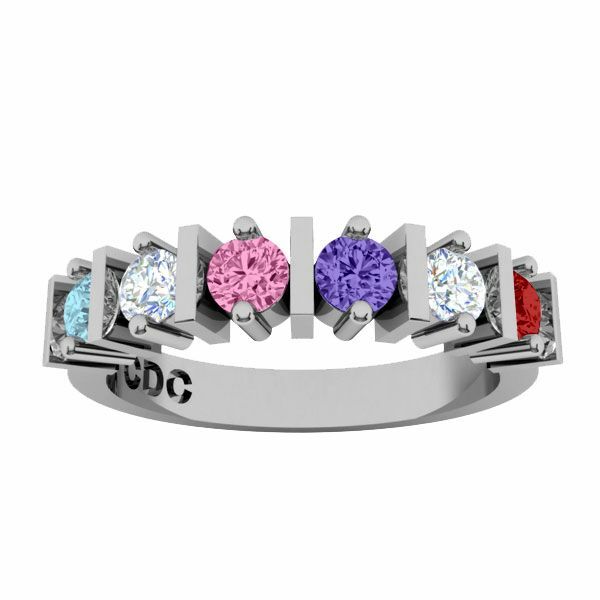 This beautiful Straight Bar Birthstone ring can be customized to fit your desires. This Stunning Mothers ring, mom ring, nana ring, can be customized for you with your choice of Sterling Silver, 10k white gold. 10k yellow gold, 10k rose gold, 14k white gold, 14K Yellow Gold, or 14K Rose Gold. Each birthstone measures 3.0mm. Gift her This Ultimate Straight Bar Mother Birthstone Ring, Mom Birthstone Ring, Mom Ring, Nana Ring, to show her that she is special and loved! Thrilled with my 5-stone ring. My second attempt to get a ring made with these stones - the first from another merchant and a stone fell out the first time I wore it. That one went back and I started over looking for a new one. I spent a bit more money than I planned, but it was SO worth it. It's a great style for different colored stones and isn't flashy. Great as a unique index finger ring.